Could we see a Crackdown 3 on the Xbox One? Perhaps, if the right development conditions can be achieved. When the Xbox 360 first debuted, it was somewhat unspectacular. Sure, things looked shiny and new, but that's to be expected from a nascent console. That vaguely underwhelming aura dissipated instantly with the release of Crackdown however. Here was a game that offered players a fully realized metropolitan area, then gave them superpowers and told them to basically go nuts. It was wildly addictive and just plain fun, and while Crackdown 2 was something of a misstep - the series was just fine without hordes of "zombies" -Â the franchise remains a high point for the Xbox 360. That said, it's been three years since Crackdown 2 hit shelves, and we've heard almost nothing about the series since that time. Until now. A Twitter user recently asked Microsoft Games vice president Phil Spencer if the Crackdown franchise was still important to the gaming giant. Spencer's response is as diplomatic as it is non-committal. 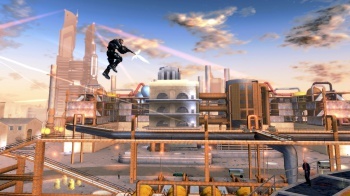 "Crackdown is important to me. Given right team and time its a franchise I'd like to see return..." Spencer tweeted in reply. While obviously Mr. Spencer couldn't very well say that Crackdown wasn't important, this does provide a glimmer of hope for fans who would like the series to make a return on the upcoming Xbox One. It's no confirmation of an upcoming sequel, but at least Microsoft is aware that fans want this thing done, and the giant corporation hasn't entirely forgotten about the games that propped it up in the days when it wasn't quite as successful at this whole videogame business thing. What about you all? This article is pretty definite evidence that I want a Crackdown sequel, but does the same go for each of you? Or has Sony's inFamous franchise replaced Crackdown as your go-to superhero simulator? Comments are below. Do your thing.